In the jungle the cheeky monkeys are up to mischief: they think it’s very funny to throw coconuts onto the other animals. 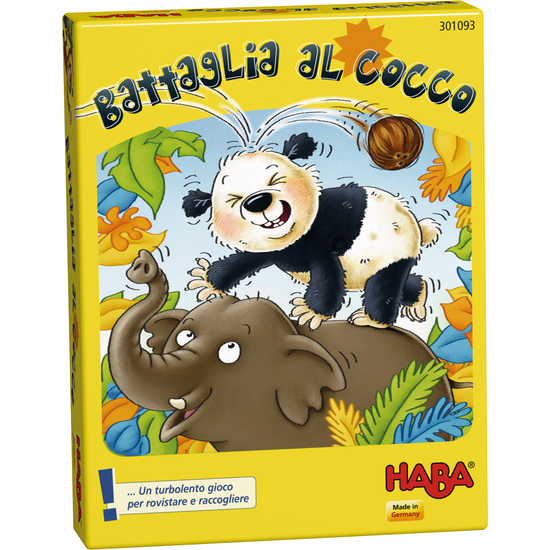 But the elephant, panda and chameleon are ready to defend themselves and take the ammunition away from the monkey. As all the players rummage simultaneously for the convenient cards, things will get quite frantic. Only the one endowed with skill and luck and who stays calm can win here. Contents: 40 animal cards (elephants, pandas, chameleons), 16 monkey cards, 4 jungle cards, 1 tiger card, 4 wooden coconut bags.